We’d love your help. Let us know what’s wrong with this preview of Unplugged by Laura Pedersen. To ask other readers questions about Unplugged, please sign up. Ella misses the days when her family used to spend time together without constant interruptions from texts, video games, iPods, and laptops, so she confiscates her family’s gadgets in an effort to do something about it. Penny Weber’s illustrations of Ella and her family tell us a lot about where they live and how they interact. Facial expressions convey Ella’s excitement over playing Hangman with her brother, her disappointment when she learns there won’t be blueberry waffles for breakfast, and h Ella misses the days when her family used to spend time together without constant interruptions from texts, video games, iPods, and laptops, so she confiscates her family’s gadgets in an effort to do something about it. Penny Weber’s illustrations of Ella and her family tell us a lot about where they live and how they interact. Facial expressions convey Ella’s excitement over playing Hangman with her brother, her disappointment when she learns there won’t be blueberry waffles for breakfast, and her outright anger when she can’t seem to get anyone to notice her instead of their various screens. The characters dress like real people, and they resemble many families I have interacted with. My favorite image is the final wordless spread that reveals the outcome of Ella’s heart-to-heart talk with her parents about trying to “unplug” their family. Words aren’t necessary, because it’s all spelled out in pictures. This book is probably best-suited to an elementary school audience. I don’t think most preschoolers could relate too well to the concept of their family’s ignoring them in favor of technology, nor is a preschooler likely to take away Mom’s cell phone to punish her for such behavior. Parents might like to share this book with kids who beg for cell phones, or with kids who spend too much time with video games and not enough time outside in the fresh air or spending time with siblings. It doesn’t stand out as a great read-aloud, but in the right situation, it could be useful for addressing very specific issues. Unplugged might pair well with Blackout by John Rocco, where a family becomes closer after the power goes out and they can’t use their devices for several hours. Overall, I see this as more of a self-help type book for kids than a story one might read for pure entertainment, but for what it is, I thought it was well-told and well-illustrated story with a plucky, authentic, and memorable protagonist. Ella misses spending time with her family. Everyone seems to be ignoring each other because they are all plugged in to whatever electronic thing they have. Her brother has his video games, her dad has his computer and her mom and sister have their phones. 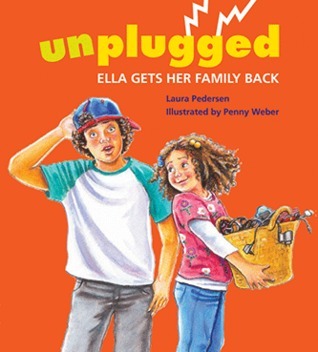 Ella has had enough and decides to unplug her family! Why I liked this book – I love the message of this book! It is well-told in the story. I like Ella’s cleverness and creativity. She probably has it because she is not plugged in! All families Ella misses spending time with her family. Everyone seems to be ignoring each other because they are all plugged in to whatever electronic thing they have. Her brother has his video games, her dad has his computer and her mom and sister have their phones. Ella has had enough and decides to unplug her family! I love it when books exceed my expectations. And this one did. Surprisingly, the story didn't come off as overly preachy. It was well written and concise. I love the idea of unplugging from devices at mealtime so that the family can connect. I also love the way Ella confronts her problems head on instead of waiting for someone else to do it for her. The illustrations were okay. I didn't hate them, but I didn't absolutely love them either. I really didn't have strong feelings about the artwork ei I love it when books exceed my expectations. And this one did. Surprisingly, the story didn't come off as overly preachy. It was well written and concise. I love the idea of unplugging from devices at mealtime so that the family can connect. I also love the way Ella confronts her problems head on instead of waiting for someone else to do it for her. The illustrations were okay. I didn't hate them, but I didn't absolutely love them either. I really didn't have strong feelings about the artwork either way. I wasn't expecting a picture book- but it's a great picture book! I haven't decided yet if I'm going to selfishly keep it or give it to my local elementary school so that many kids may enjoy it as much as I did. I received a copy free through Goodreads First Reads. This was a really cute story about unplugging and connecting!! Kids will like it and grown ups can learn a valuable lesson from it!! Beautiful illustrations!! My Nice is in love with it and I may never see my copy again! I absolutely adore this book! Everyone needs to unplug at times and this is a great little story. I REALLY LIKED THIS BOOK. I WILL SEND IT TO MY NIECES. I WON BOOK FROM GOODREAD. the story was nice. The pictures were eh. I like that it is a multicultural family.